Glenda J. Meadows, age 65 of Lyndon, died Saturday, August 29, 2015 at OSF St. Luke Medical Center in Kewanee. Glenda was born on June 9, 1950 in Decator, Ill.; the daughter of Ottis and Velena (Gregory) Meadows. Survivors include her mother, Velena of Lyndon; one sister, Carla (Kenneth) Royer of Naples, Fl. ; one brother, Patrick (Jill) Meadows of Lyndon and many nieces and nephews. She was preceded in death by her father, Ottis, her sister, Naomi Meadows, and one nephew. Visitation will be Wednesday, September 2, 2015 from 10:00 – 11:00 A.M. at the McDonald Funeral Home in Prophetstown. Funeral service will follow at 11:00 A.M. at the funeral home with Pastor Alan Jahn officiating. Burial will be at Lyndon Township Cemetery. 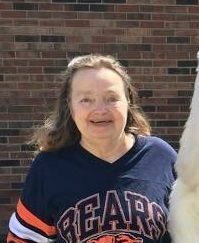 LYNDON – Glenda J. Meadows, 65, of Lyndon, died Saturday, Aug. 29, 2015 at OSF St. Luke Medical Center in Kewanee. Glenda was born on June 9, 1950, in Decatur, the daughter of Ottis and Velena (Gregory) Meadows. Survivors include her mother, Velena, of Lyndon; one sister, Carla (Kenneth) Royer of Naples, Florida; one brother, Patrick (Jill) Meadows of Lyndon; and many nieces and nephews. She was preceded in death by her father; her sister, Naomi Meadows; and one nephew. Visitation will be from 10 to 11 a.m. Wednesday at the McDonald Funeral Home in Prophetstown.